For as long as she can remember Lilit has been disabled. When she was just six months old she was accidentally dropped by her cousin from the second floor. Lilit sustained a severe spine injury — scoliosis — that she would have to live with for the rest of her life. As Lilit grew older she became passionate about helping people with disabilities like her own. She worked as a volunteer at Equal Rights Equal Opportunities (EREO), a nonprofit organization in Armenia for people with disabilities. Through her deep interest in human rights and the rights of others with disabilities, predicated by her own experience, Lilit also began studying human rights law at Helsinki Citizens’ Assembly in Vanadzor. Soon after becoming an activist for those with disabilities Lilit began experiencing problems with her vision. Her mother, Susana, said her poor vision caused her great pressure and stress. Lilit eventually visited a local doctor, who said that the young woman would need a corneal transplant as soon as possible to avoid blindness — a costly procedure for most Armenians and one Lilit and her family could not afford. Lilit was distraught and did not know what to do. Vardine remembered the Armenian EyeCare Project, an organization she had heard about through her grandmother, who received eye surgery with the nonprofit at no cost. Vardine sent off a quick email, thinking it wouldn’t result in much. Soon after, Vardine received an email back. “It was amazing how helpful and how prompt their response was,” she said. 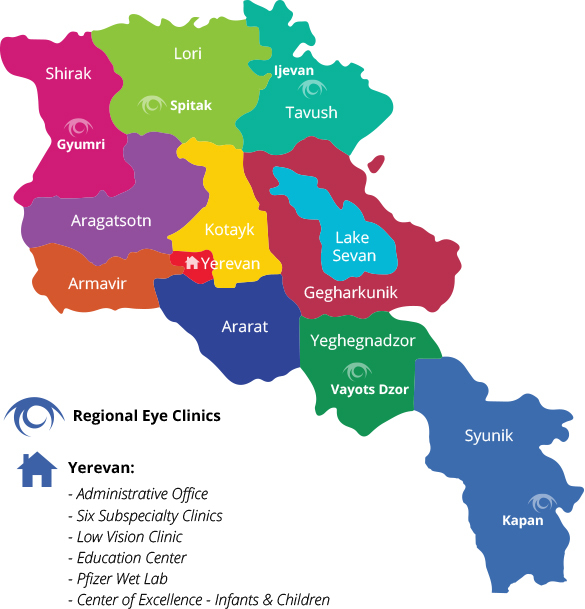 The Armenian EyeCare Project told Vardine about its Corneal Transplant Program, which matches patients in Armenia who need a corneal transplant with donors who sponsor the surgery. Through the program, Lilit would be able to receive her corneal transplant at no cost. “We were able to organize and perform Lilit’s surgery,” said Dr. Anna Hovakimyan, the surgeon who directs the Corneal-Uveitis Clinic at the Malayan Ophthalmological Center in Yerevan. Dr. Hovakimyan donates her surgical fee to keep costs down. With her eyesight restored Lilit is able to read, write and use the computer again. Best of all, she can continue her work as a disabilities activist — working on projects she is passionate about and that give her life meaning. “I am so happy to continue my education,” said Lilit. Her colleagues are also glad that Lilit is back with her vision restored. “We are happy Lilit can be part of our team again!” said Anush. Through her volunteer work and education, Lilit eventually plans to pursue a political career and become a decision-maker in disability law in Armenia — working to make her country more accessible for people who are disabled. Lilit knows this would not be possible without her restored vision and she is very grateful for the doctors and the donors who gave her life a purpose once again.